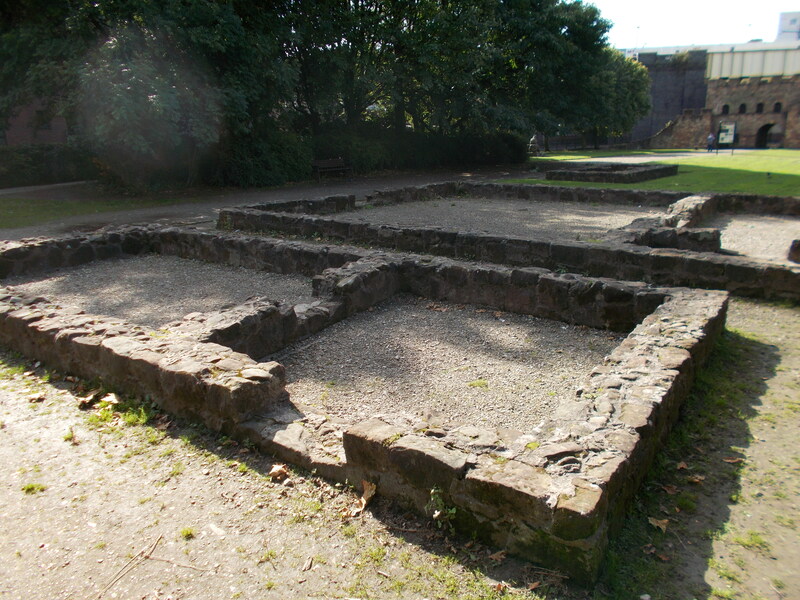 The Romans built their first fort at Manchester in 79 AD on a carefully chosen strategic site. Built on a sandstone outcrop it was close by a crossing point on the River Medlock, near to where it meets the River Irwell. They called the fort ‘Mamucium’, which either means ‘breast shaped hill’ or comes from the Celtic name for the Medlock. Two Roman roads ran close by: Chester to York and the North-South one to Ribchester (along modern day Deansgate). The first fort built on the site was large enough for 480 men. It was not made of stone, but was a ‘turf and timber’ construction. This meant it had a turf rampart, with a timber palisade (defensive fence) on top. The gatehouses and towers were also made of wood. A deep ditch would run around the perimeter. In 140 AD defences were demolished and reconstructed and just twenty years later the whole fort had a major rebuild. Still built of turf and timber, the new fort was nearly doubled in size covering two hectares. The expansion appears to have been on its western side. It may have been that the fort was acting as a food supply depot, and it was the granary buildings that were expanded. Sometime in the late first century to early second century, a special annex area outside the north and east sides of the fort was constructed. This was bounded by a deep V shaped defensive ditch, and other features including ramparts and palisades have been excavated nearby- presumably part of the protection for this same outside area. 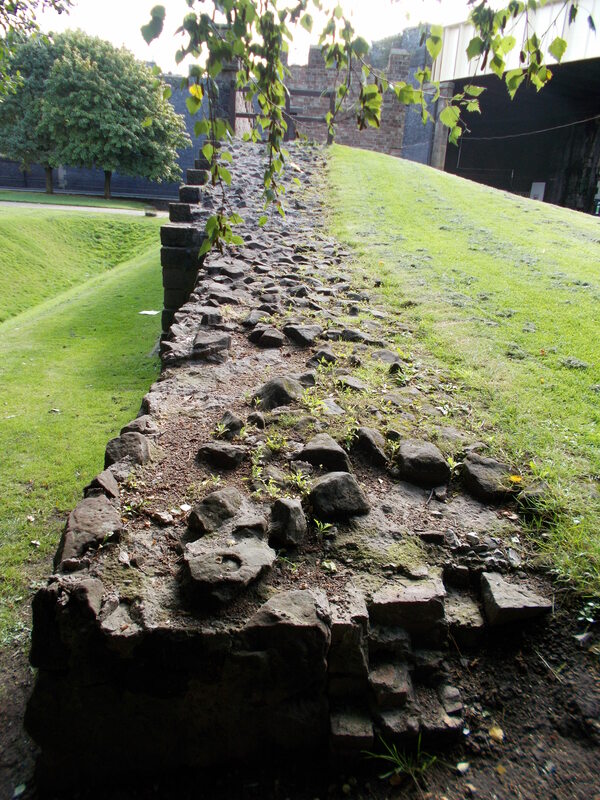 The archaeology shows that extensive metalworking activity was being carried out in this protected site, to keep the Roman army supplied with weapons and armour. In 200 AD the fort defences were strengthened yet again, this time the gateways being remade in stone and a stone wall cladding placed in front of the turf rampart. The military annex area in front of the fort had now become a fully fledged industrial zone. Pottery kilns, metal worker furnaces and tanning pits for leather have all been excavated in the area by archaeologists. Iron working seems to be have been carried out on a very large scale. The area beyond the annex consisted of the residential and service buildings of the vicus (civilian settlement). Some 2000 people would have been living here. Workshops, houses, shops, an inn, a number of temples and a bath house have all been discovered. Most building would have been been made from wood, with wattle and daub walls and thatched or tiled roofs. The road running out of the North gate would have had shops fronting onto it, with living accommodation and a yard behind them. Two buildings excavated are of particular interest. The first is a ‘mansio’, (a kind of Roman hotel) which was discovered at 340 Deansgate. Fronting onto the Ribchester road and close to the Chester to York road, it was constructed for the use of travelling Roman officials. Much larger and grander than the buildings around it, it was probably two stories high and had a roofed colonnade (or veranda) enclosing it . Similar mansios have been discovered at Chester, Carlisle and Old Carlisle. A second excavated building of interest was a wooden temple, enclosed within a sandstone wall. Finds from the site include cremated remains, specialist samian pottery associated with feasting and drinking, and a ‘lead curse figurine’. Sometime around the mid 3rd century the civilian settlement went into decline. Much of the vicus area became largely derelict. The temple was demolished, its structural posts were burnt and the stone robbed away. Despite the abandonment, the fort still had soldiers in until the end of the Roman period, around 400 AD. The North gate was blocked up, the ditched causeway in front was removed. Little is known of what happened next but archaeology has revealed that sunken featured buildings were constructed just outside the North gate soon after the military abandonment of the site. For the next thousand years the site fades into obscurity. The place name Castlefield (castle in the field) lets us know that its ruins survived for quite some time, up to the Georigan era. Antiquarians of the 16th and 17th century, including Leland, Camden and Stuckley all visited and described the Roman remains. Then came the industrial revolution and this caused much damage to what was left. 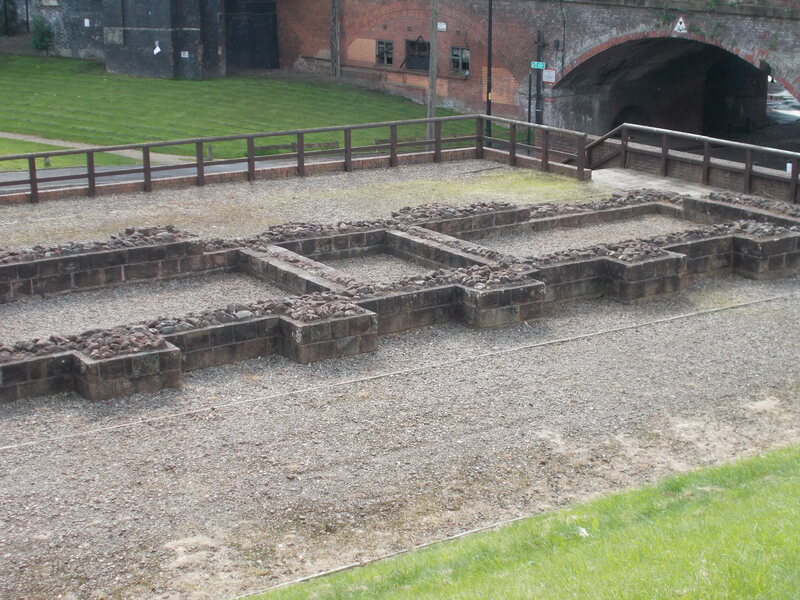 In 1760 the fort’s bathhouse near the River Medlock was destroyed by the construction of the Bridgewater Canal. The later Rochdale canal and railway viaducts destroyed much of what remained of the fort. Just after the turn of the 20th century the first archaeological dig was carried out. A whole series of more recent excavations of the fort and vicus have occurred over the last 40 years. These have been very thorough and have led to the huge amount of knowledge that we have about the fort and vicus today. The decision was made to put some of the remains on display and reconstructions were also incorporated into what we now see. On visiting the site today, approaching the ‘Roman Gardens’ from the Liverpool Street entrance, we come across three vicus property foundations. There is an inn, a house and a small shop, all in situ on the original excavated site. 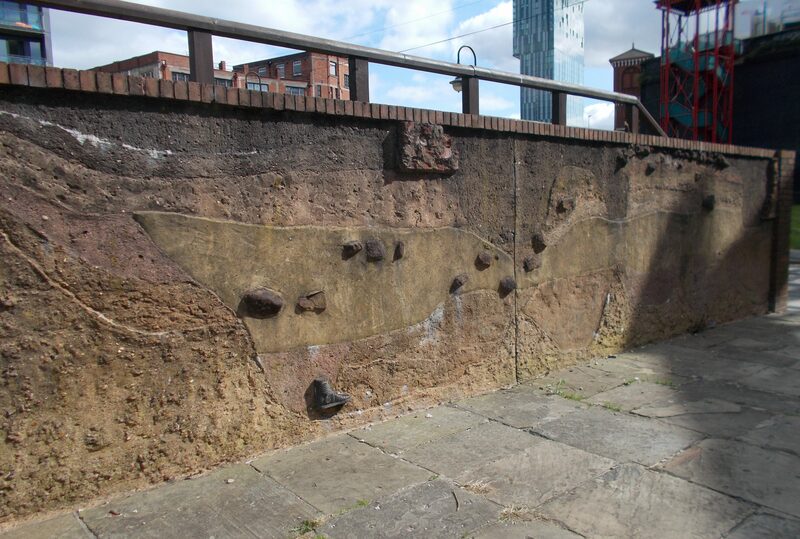 These are clustered around the North gate road, which led onto the main Roman road on Deansgate. Just in front of the reconstructed North gatehouse we can see two double ditch defences, running along in front of the fort’s wall. The North gateway reconstruction is built on the site of the original and some of the Roman stonework can be seen at the base of the structure and in the walls. The gate itself has two sets of inscriptions on either side. These are based on fragments discovered on the site. The translation of the larger one is “For the Emperor-Caesars Lucius Septimius Serverus Pius Pertinax and Marcus Aurelius Antoninus Pius, both Augusti, and for P. Septimius Geta most noble Caesar; the vexillation of Noricans and the vexillation of Raetians made this gate with its walls at the command of Alfenus Senecio, of senatorial rank, consular governor, under the charge of Senecianius Martius, centurion of legion VI Victrix” . 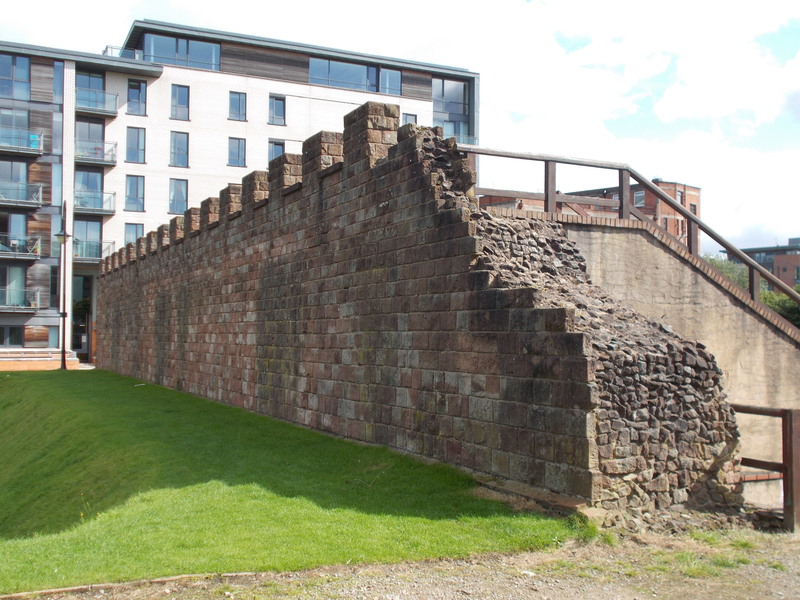 The Raetians (from Switzerland) and Noricans (from Austria) were soldiers stationed in Manchester and the Emperor Septimus on his visit to Britain may have been behind the building of the stone defences. You can walk throught the double door gatehouse entrance, and also up onto the top of the defensive wall. This gives excellent views of the vicus area and the paired double ditch defences below. Just a short distance away lies the substantial reconstruction of the fort’s western defensive wall and parts of the excavated granaries. The granary buildings would have been carefully constructed and maintained to keep the grain cool and dry. A raised floor would keep air circulating underneath and large overhanging eaves would direct rain into drainage ditches around the building. There’s also a large ‘mural’ which shows how archaeologists have interpreted the various phases of Mamucium. There were also two garrisons from nearby Melandra Roman Fort associated early on with Manchester and to see more about this fort click here. The site is open access and free to visit. There’s lots of on-street parking (with parking meters) nearby to both parts of the fort. Liverpool Road is perhaps the easiest to get to and park on. 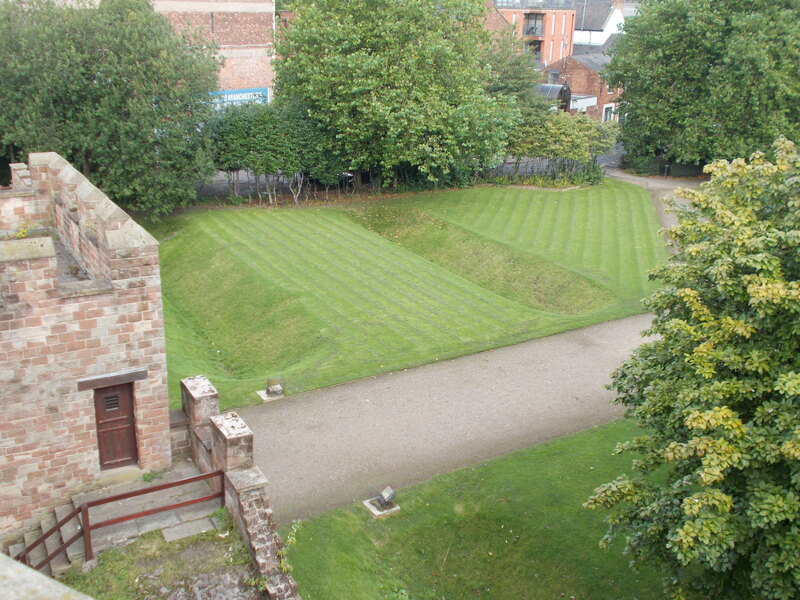 The ‘Roman Gardens’ area is just next to the road, a little way up from the Air and Space Hall of MOSI.